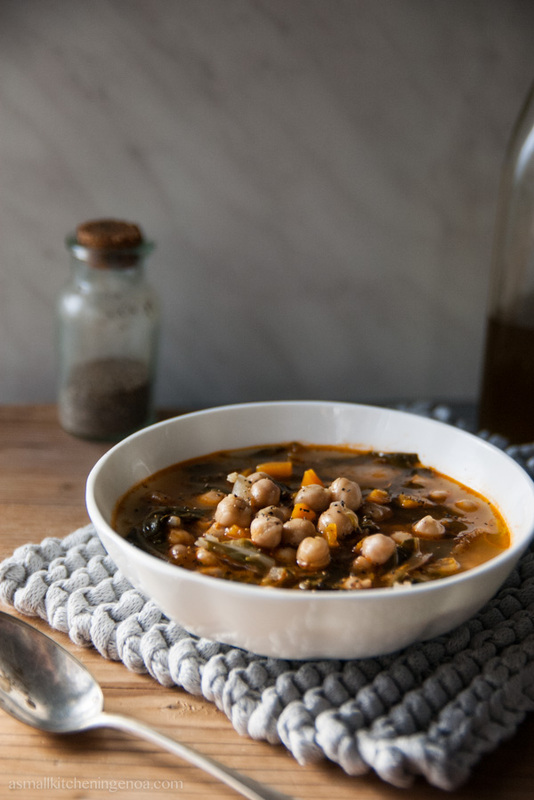 Chickpeas and chard soup is a classic fall recipe of the Italian Riviera. As you know in the past peasants used to cook lots of pulses in their every-day meals. Meat was always lacking and it was saved for feast days. Pulses – as chickpeas – stead were cheap, highly nourishing and easy to store for the winter times. Chard, on their hands, in the Italian Riviera grew spontaneously in the fields also in winter time. This soup came to my mind yesterday because yesterday the Autumn cold eventually knocked at our doors. Two days ago everybody here was complaining about the weather saying that such a hot November was indeed wire and rare. Well, no sooner said than done! Our chilliest and strongest wind coming straight from the mountains behind Genoa and called Tramontana started blowing at night. Yesterday morning we woke up and the temperature had dropped of 10 degrees, the air had become crisp, the sky clear blue, the threes almost naked. In days like these when you walk down the streets blades of cold wind assault you. They enter your coat – anyway – from the sleeves up to the armpit, from the neck down to the underwear. Nobody is safe and warm enough. Neither at home where Tramontana enters from the splits of the windows or from the fireplace hoods. For those who moves by moto (as I do) Tramontana means loosing the touch at the fingers and a clinically frozen nose. 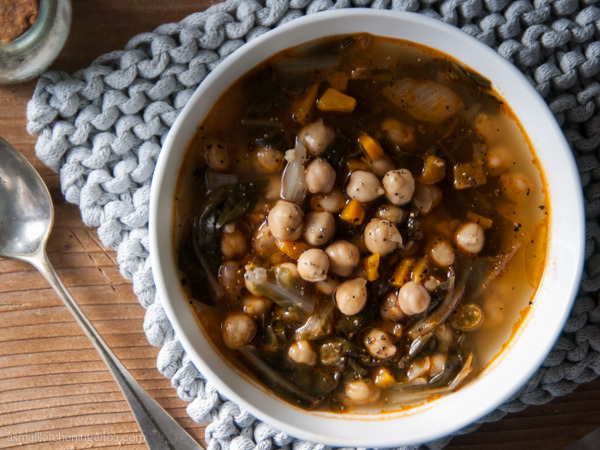 At the end of day spent fighting this way, I swear, what you desire most is a heavy wool blanket and a hot, rich and healthy soup, like a chickpeas and chard soup. Here is my family recipe. Hope you will enjoy, keep calm and stay warm! Warm the vegetable broth in a pot. Dice the carrot, the onion and the stick of celery. 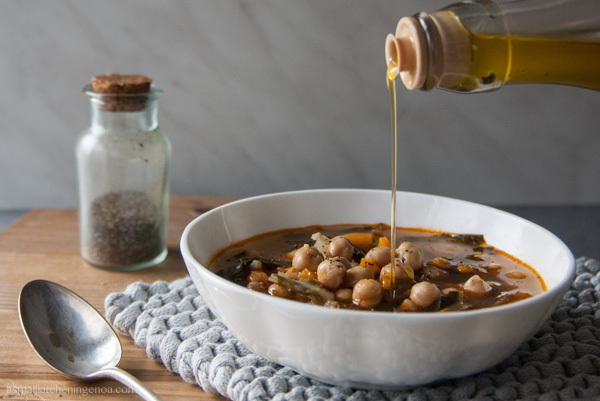 Pour in the saucepan– the one where you will cook the soup – jointly with the olive oil. Let the vegetables golden for 5 minutes at low heat. 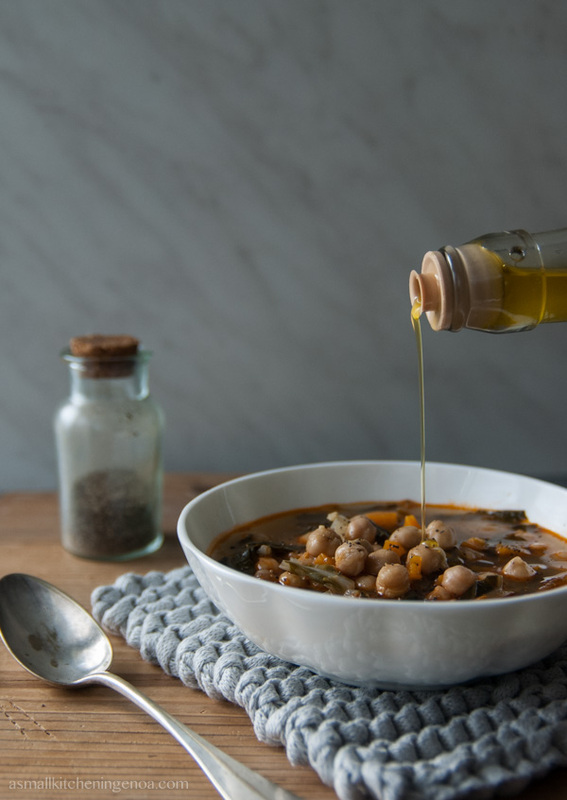 Pour the chickpeas – previously drained – and let them savor with the vegetables for a couple of minutes stirring constantly. Clean the chard and cut them in slices of 1 inch. Put them in the saucepan and stir. Add the hot vegetable broth, cover with a lit and let cook at low heat for 45 minutes. Adjust of salt and complete the plate drizzling extra-virgin olive oil and a pinch of pepper. If you wish you can put a slice of toasted bread in the soup plate before pouring the soup. If you liked this post please share it with the “share” button here below! Thanks.